I really found this piece useful and it was a really hard hitting article, it shows clearly everything clearly you need to know. The ego gets a bad rap these days. It’s common to hear complaints about how this or that person has a “huge ego.” Even Eckhart Tolle (whose writings I have been totally inspired by) talks a lot about how to free yourself from your ego. But what is the ego, anyway–and is it really all that bad? Well, there are actually 2 very different ways it can show up: as the negative ego or the positive ego. The Negative Ego The one I refer to above is often called the “negative ego.” It is the part of us that creates a sense of separation between ourselves and others, that labels people and things as “better than” or “worse than.” It’s the part of us that clings to things outside of ourselves, making them a part of our identity. Unfortunately, this clinging is the source of all suffering. Whether it’s your pride, your car, your looks, your job, even personality traits you identify with (like generosity or goofiness)–when you begin to define yourself through things or concepts, it becomes painful when you inevitably must part with them. To protect itself, your negative ego will hang onto these things at all costs, even if it means judging or harming yourself or others, or otherwise twisting the facts. Last I checked, I haven’t reached enlightenment, and therefore my negative ego still sneaks up on me at times. Here’s an example: While visiting family last month, I couldn’t resist eating some non-Paleo food that I used to eat with my family growing up. Unfortunately, after a few days, the food I ate wreaked havoc on my sensitive digestive system, which doesn’t respond well to things like gluten, dairy, sugar, tomatoes, and even citrus. I felt bloated, nauseous, and cranky. And that was a perfect recipe for my negative ego to come in, telling me stories like the following: “No real CrossFit trainer would have so little self-control!” “Everyone else can eat these things and feel just fine. I’m clearly a freak.” “Everyone else can eat these things and feel just fine. No friggin’ fair! !” “Look, I got myself sick AGAIN. What the heck was I thinking? Have I still not learned this lesson? I’m such an idiot!” Ouch, right? Well that, my friends, is how the negative ego causes suffering. Can you sense the fear underneath? The Positive Ego The negative ego is really just a tool gone rogue–like a lawnmower that somehow animates itself and tears apart the flowerbed. (The ex-software-engineer part of me is tempted to go off on some creative tangent about artificial intelligence and sentient appliances…but I’ll spare you.) But if you know how to use it, it can be a really useful ally. So what’s the ego’s intended function, anyway? 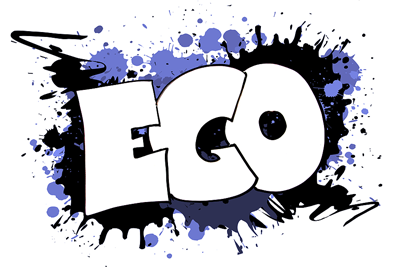 The Freudian definition of “ego” is simply, according to Wiktionary, “the most central part of the mind, which mediates with one’s surroundings.” That’s all! The ego is meant to be our window to the world around us–a neutral and extremely useful source of information about what’s happening. Let’s imagine my sad food story again. What if, instead of allowing my negative ego to spin stories and create drama around what was happening, I simply approached the situation with my positive ego? “I notice my stomach is bloated. I think it was the food I just ate.” “Hm, I notice a craving feeling for this food that I know makes me feel nauseous.” “Oh look, I just ate something that tasted pleasant, and now I feel tired and low energy.” Kind of bland compared with the negative ego. But by thinking of the situation this way, I could have spared myself the unneeded self-flagellation and instead made a conscious choice. Whether I chose to enjoy the food and face the consequences, or find other foods to satisfy my cravings, or avoid them for the sake of being more present and joyful with my loved ones–it doesn’t really matter. The point is that when you strip away the fear, the stories, and the judgements away from what’s happening in this moment, and simply notice it, you become free to choose your response. Using the Positive Ego to Set You Free Here are some techniques you can use to get your ego working for you: Notice the negative ego. Knowing is half the battle. Start trying to catch your negative ego in the act of spinning tales around what’s happening. Focus on the facts. Ask yourself, “What’s actually happening right now?” Then ask, “What if I let go of right/wrong and good/bad?” Use your positive ego on your negative ego. You can actually use the tactic of non-judging observation on your negative ego itself. If you’re agitated, simply notice, “What’s happening?” Whatever you observe in yourself–whether it’s judgement, irritation, despair, guilt–the key is not to make it right or wrong. Break out your inner nurturing parent. Imagine your negative ego is a young child that is frightened, insecure, or panicked. Give it some unconditional love and compassion. When does your negative ego tend to get you down?